Big Train Chocolate Chai Tea Latte Mix, 3.5 Pound -- 4 per case. Big Train Chocolate Chai Tea Latte Mix, 3.5 Pound -- 4 per case. Taste the drink that has been savored for centuries in India and refresh your body and soul with the creamy blend of honey, Dutch Chocolate, black tea and exotic spices. 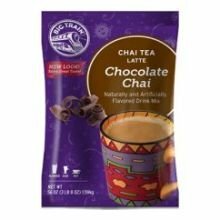 In addition to being Kosher Certified, Big Train's Chocolate Chai is gluten free, contains no hydrogenated oil and can be made with water or your choice of milk. Enjoy hot, over ice or blended - Namaste.